If you perform a search for “Email marketing is” in Google and it will suggest “dead”. You’ve heard it before, right? For the last several years, marketers have been talking about the life span of email marketing. And for those of you who still click “Send to all”, the kind of one-size-fits-all email marketing blasts, then yes, marketers are right – That type of email marketing IS dead. 9 out of 10 marketers do not segment their email lists. You need to do better. Email marketing is more than just quickly rounding up content, hitting send and forgetting about it until the following week. And one way to get more ROI from your marketing is to send trigger based email marketing campaigns. What are trigger based email marketing campaigns? Trigger based email marketing campaigns are exactly what they sound like – Automated emails that are triggered by a specific action by a web visitor or customer. One of the key benefits of sending trigger based email marketing campaigns is that once created, they continue to run without the labor-intensive work usually required to send email campaigns. Trigger based emails are sent out automatically based on an important event that is related to your website goals. In most organizations, the most common form of these “low-volume, high ROI” trigger based emails consist of welcome emails (a web visitor creates a new account) and order confirmation emails (an order has been placed). This quick response makes trigger based emails timely, highly relevant and personalized, and you are more likely to convert someone as they are still actively thinking about a product or topic that triggered their action and your email in the first place. Why are trigger based emails important? You can achieve all three using trigger based marketing. Trigger based email campaigns are a great addition to any marketer’s email marketing toolkit but are often over looked. Trigger based email campaigns make up a low percentage of overall email volume, at around 2.6% but don’t let that fool you as that 5% can be responsible for more than 20% of your email marketing revenue. What type of trigger based email marketing campaigns does your organization use? And by raising the level of sophistication of your triggered email marketing campaigns, you can significantly increase your overall email marketing revenue. According to research by Forrester Research, trigger based email marketing campaigns can generate 4x more revenue and 18x greater profits. Whether it’s through real time targeted emails or personalized and behavioral based campaigns, sending trigger based emails is a sure fire way to lift conversion rates. Increased customer loyalty: When a web visitor opts in to receive promotional emails, they are showing you a level of trust. Trigger based email marketing provides you with an opportunity to build upon this trust by delivering relevant and informative content based on customer preference and behavior. Increased relevance. Inboxes are more crowded than ever. In order to stand out, your email needs to be relevant. By sending a trigger based email based on an event gives you the ability to create highly targeted and relevant campaigns based on the customers interests at a time when they are most responsive. Increased efficiency. Using marketing automation to implement a trigger based email marketing campaigns allows you to focus on improving your campaign performance, instead of manually segmenting and uploading lists. Increased revenue. The many variations of trigger based emails allow you to create and design the perfect email campaign for every stage of the buying cycle – starting with the welcome email down through to the post-purchase process. Where do you start with trigger based email marketing? Start by looking at your websites core funnel. If you see a high drop off from one step to another that will be your key trigger. If you’re an eCommerce store, this will mean analyzing your checkout process – from home page to product page and through to the payment and confirmation pages. Your goal is to increase the number of online sales. For a SaaS website, you will want to review your sign up process – from home page to free trial pages and through the customer activation funnel. Your goal is to increase the number of free users into customers. Once you have found your key trigger, you can begin creating trigger based email marketing campaigns for a wider range of events and/ or changes based on customer preferences and behavior. To get you become more inspired, we’ve put together seven examples of trigger based emails that you can use and implement today! You have a new sign up – Whether that’s someone who has created an account, subscribed to your blog or opted it for newsletters – Use this opportunity to welcome them. A welcome email from the founder/ CEO is a great way to build trust. Explain who you are, and what you want to achieve with your brand. Make sure you thank them for signing up and if you offer a free discount/ free trial, promote that in this email. 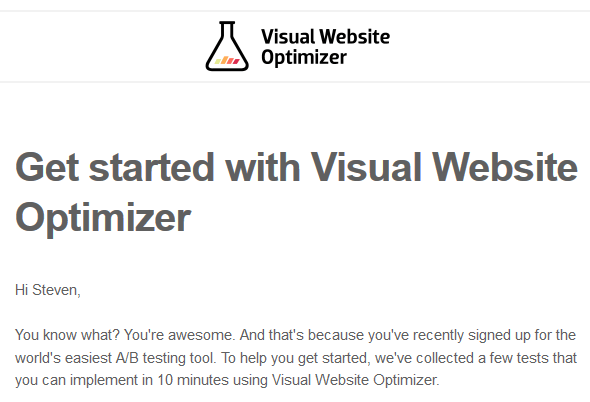 Visual Website Optimizer have nailed it with their welcome email, which includes case studies, a video and steps on how to get started with A/B testing. You have a new sign up. An account has been created by a potential customer but three months go by and still no purchase. What caused them to create an account but not buy anything? Something is wrong, and you will want to address what that is. Send this trigger based email to remind them about why they created an account in the first place and the benefits of your product or service. 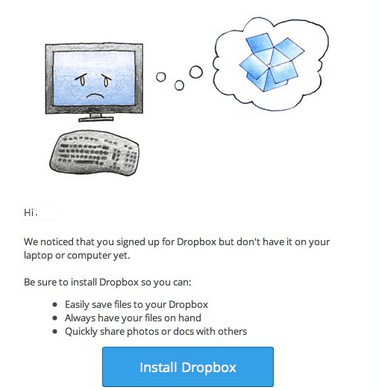 Dropbox score top points for their activation email. No one wants a sad computer looking at them, do they? You have a customer who hasn’t bought anything during the last six months. Most customers will not leave your brand because of price – They often leave because they think you don’t care about them. Now is the time to show them you care. Send this trigger based marketing campaign to win them back, which could by offering a discount – Or if you offer free shipping/ free trial, highlight that too. The example below is from Kyjen. Seriously, does it get any cuter than this? 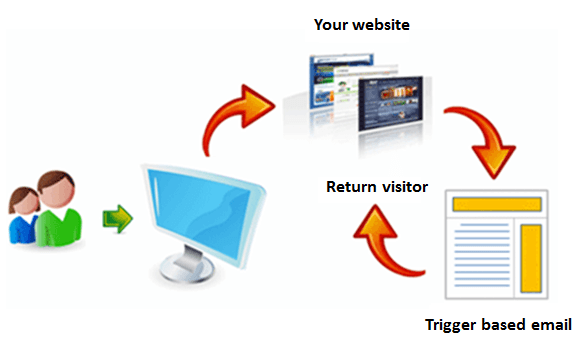 Nearly 7 out of 10 web visitors who initiate an order don’t complete it. That’s a lot of people who think twice before they click the “Pay now” button. But what is stopping them? Most of the time, it comes down to pricing and timing. Highlight information such as product returns, price match guarantees and free shipping in your trigger based email campaign to turn an abandoned shopper into a customer. 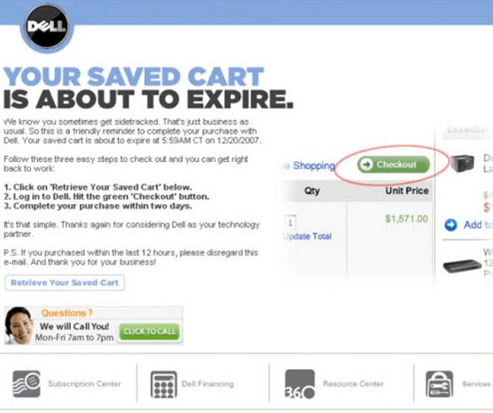 It really doesn’t get any better than Dell’s abandoned cart email and they make it really easy by including a picture of the item and a direct link to complete checkout. When visitors are logged in and they add an item to their shopping cart, they are showing interest in a product. The intent to buy (eventually) is there but for one reason or another (again, most likely pricing or timing), they decide not to. These products can stay in the wish-list for 30 days or more. If so, remind the shopper that they have items in their wish-list and include product images, descriptions and reviews of the products. The list would not be complete if we didn’t include Amazon – The masters of personalized, trigger based email marketing campaigns. Customer loyalty is key to the success of your business. And you can use trigger based email campaigns to grow your loyal customers. Target your highest spending customers. Whether they have purchased several products this year or upgraded to your “Gold” SaaS pricing package – And send them an email with a free gift card/ free consultation. 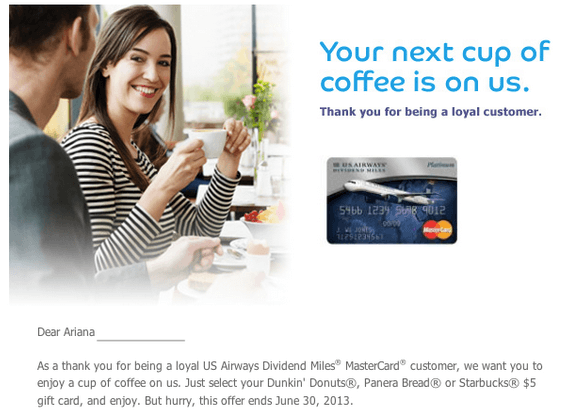 It might seem small, a free cup of coffee, but this is kind of WOW service customers love – Kudos to US Airways. Customers contact customer service. 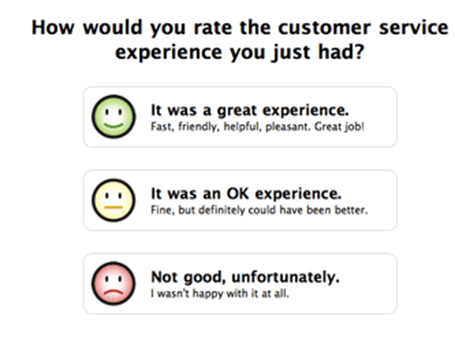 It’s part of the job but, you can use this to your advantage and follow up with your customers to see if there question/ concern was addressed. Most customers will leave your brand because they feel you do not care about them. This email shows that you care. In the follow up email, ask your customers how they thought you did in regards to your customer service handling and if possible, include a survey and collect feedback. A great way to incentivize readers in to completing the survey is offer a discount on a product or service. Basecamp make it extremely easy for you to provide feedback in a fun way. With one click, they are able to improve their service and grow their business. Although there is an investment required up front, the best part about trigger based email marketing campaigns is that they run on auto-pilot while generating revenue for your business. And while most brands have taken the step to create standard trigger based campaigns, it may be time to revisit and optimize your trigger based marketing campaigns in order to create even more revenue from your email marketing activity. Marketing automation platforms are designed to engage and convert your subscribers. 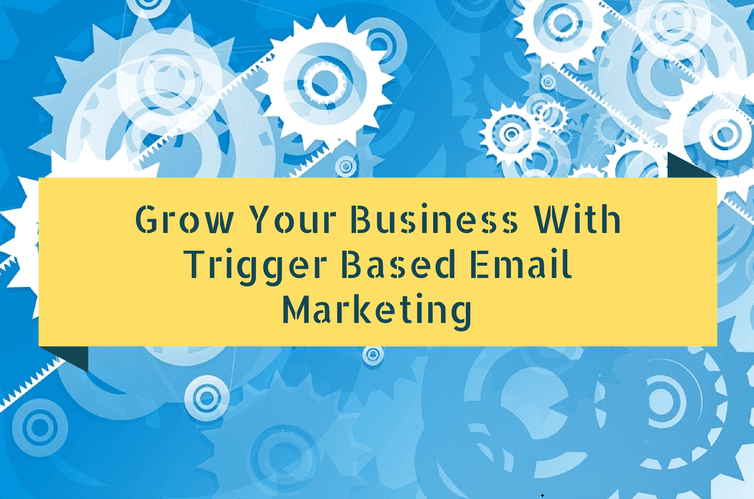 You can get started with trigger based email marketing and sign up for a free trial here. 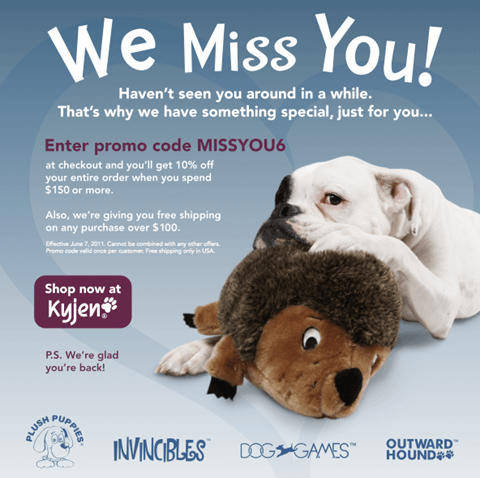 What are some of your favorite trigger-based email campaigns? Let us know in the comments section below. Steven is a guest blogger and content strategist at eMarketeer. With a proven track record of successful traffic growth and more than ten years of experience as a professional in the online field Steven’s writing will surely inspire you to improve your marketing. b) Order out for delivery e-mail. d) Shopping cart abandonment email. e) Birthday’s & anniversary wishes e-mail. etc. Having your feedback would be great. Thanks for the comment, Divya. You’ve put together an awesome resource on trigger mails. Great job! Hey, thanks for sharing very useful information about Email Marketing. Glad to see your other blogs about email append service.